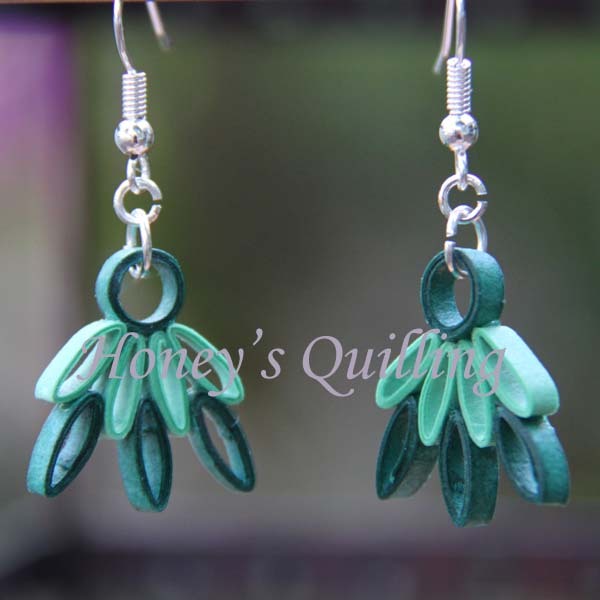 Today I am sharing with you a pattern for a pair of earrings that I made years ago. I call it a pattern instead of a tutorial because I don’t have full step by step photos. I have some photos from different earrings, but the same steps. This was one of the designs I made in my first year of having my Etsy shop. I was just playing around with some extra pieces to see what I could make and this is what I came up with. I liked it, but I didn’t know what to call it. It was one of my sisters who said that it reminded her of a reflection of a lotus flower in the water. So that was that! 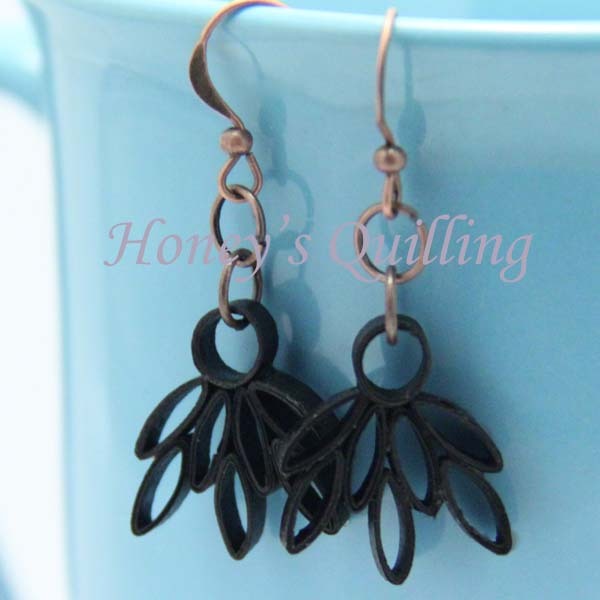 To make the shapes for these earrings I use the end of a specific quilling tool. 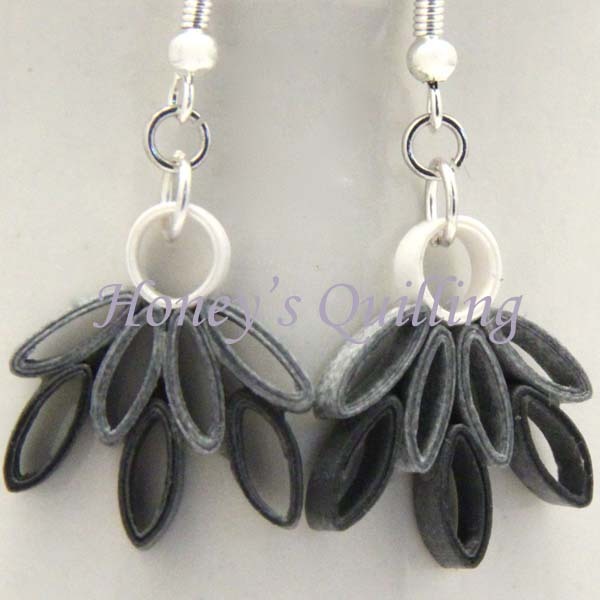 You can find it on Amazon , at Custom Quilling, or at most other places that sell quilling supplies. You can also use any other object that has a similar diameter. If yours is bigger than this, your final design will be bigger and you might also want to use strips of paper that are a little longer. If your object has a smaller diameter your final design will be smaller. It is very flexible! The diameter of the end of my tool is 3/16″ or 4.5mm. 16 strips of paper, each 3 inches long. You may want to use longer pieces of paper if you are using a larger diameter tool. I use paper that is 1/8″ (3mm) wide. You can use any width paper you like, you may have to adjust the size of your jump rings accordingly. Aluminum handle quilling tool or another small diameter item like a narrow pen, etc. earwires and jump rings (I use a 4mm diameter jump ring to attach to the earring design and then a 3mm jump ring to attach that to the earring hook). Take a strip of paper and wrap the end around the end of your aluminum tool (or any other object you are using instead. The diameter of the end of my tool is 3/16″ or 4.5mm). Place a tiny tab of glue at the end of your paper. Hold the end with the dab of glue and make sure it tucks under the strip as you start rolling. Roll the strip of paper around the tool. Once you come to the end of the strip place another dab of glue at the end and glue it tightly. Carefully twist the bead off of the tool without squishing it. Repeat with all of your strips so that you have 16 circles. Leave two of them as circles. Squish the other 14 so that they are an eye/marquis shape by pinching on opposite sides. Lay one circle down on your workboard or other plastic surface. Add a dab of glue to the end of one marquis and glue it to the circle. With the next marquis add a dab of glue to one end plus one flat side at the spot where it will touch the marquis it sits next to. Repeat with two more. Now you have a circle with four marquis on it. You will be adding three more pieces to the design, in the 3 spaces between the four marquis that are already attached. Dab some glue on each side of the top of a marquis and put it in place. Repeat with the other two. Your design is finished! Repeat with the other pieces to get your 2 earrings. After the earrings are dry, you can either do the sealer first or you can attach the jump rings and earwires and then add the sealer. Usually I add the liquid sealer first, let it dry, add the jump rings and earwires, paint on the topcoat and hang it to dry. Because you are making solid open circles, there are no delicate coils to worry about when it comes to putting on the sealer . Therefore you can follow the sealer instructions from this spiral earrings tutorial and just dip your piece into the sealer using a tweezers, making sure it is all covered, dab it on a tissue, and then place it on a plastic surface to dry. Like these spirals? Click here for the free tutorial. Looking for more specific instructions for sealers, topcoats, and glazes? Click here to read all posts on that topic! Here are some more colors that I made. I hope you enjoy the tutorial and find it helpful! If you like it, please share it on Pinterest and Facebook! Feel free to leave any comments or questions, and stick around to view some more great pages here!